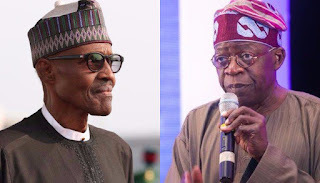 A National Leader of the All Progressives Congress, APC, Bola Tinubu, has called on President Muhammadu Buhari to put in more efforts towards reducing the sufferings of Nigerians. Tinubu, who noted that the present administration had achieved a lot in the two years of its existence, added that many Nigerians were still too poor to be overlooked. The former Lagos State Governor said this while delivering a keynote address at the public presentation of a book, “Making Steady, Sustainable Progress for Nigeria’s Peace and Prosperity” at the old Banquet Hall of the Presidential Villa, Abuja. The book, authored by the Presidential Media Team, is a mid-term scorecard of the President Muhammadu Buhari administration. Tinubu said, “True, much good has been done by this government to ignore. However, too many of our people remain too poor and put-out to ignore as well. Daylight comes but not yet to all and not in equal measure. “Due to the neglect of prior governments, our economy was not allowed to blossom in a way that offered jobs to the poor and empowered the common man. “Where prosperity should have stood , poverty was erected. Where progress should have been established , stagnation assumed residence . We are trying hard to escape this deep hole. “While we work towards this good end, we must recognise the situation of millions of our people. Wrongfully denied for so long, they suffer still. But we ask them to take heart . Don ’t forfeit hope. “Understand that tomorrow will not be as the past when what was built and bought was not intended for you. “What we are now building, is meant for you. This is your government and you will be the beneficiaries of its policies and programmes. You are no longer the forgotten . You are the hope and promise of a nation and its future. “As this government implements its economic plans, the griping poverty you have long suffered will give way and ultimately turn into the fertile progress and prosperity that only good governance can bring. We do this with a sense of urgency! The APC chief noted that the 2018 Budget that was recently presented to the National Assembly would move the nation farther in the right direction. He continued, “It is a bolder, more creative one than this government’s earlier editions. “It shows this government has embraced its progressive identity despite the chorus of opposition . Also that it more clearly realises the depths of the economic and financial challenges before us. “One of the important aspects of this budget is the capital expenditure for needed infrastructure. “This investment means the government fully recognises our economy must grow but that it cannot expand beyond the parameters of the infrastructural grid that serves it. “With this book and with the budget we come to the place where past intersects with the present to interact with the future; the place where what we do or don’t do will dictate the Nigeria of tomorrow. The former governor called the government’s attention to three key ideas – the establishment of a robust industrial capacity; the need for a national infrastructural plan; and the need to help common farmers by improving rural output and incomes. He pointed out that said Nigeria’s future was one of beckoning challenge, yet potential greatness. “Through no fault of their own, too many of our people are without. Too many parents cannot properly feed and clothe their precious children, too many young adults exist in the void of joblessness, and too many of us do not have the resources to care for elderly parents who once cared for them. We must cure these wrongs. “If I were an architect, I would say that President Buhari has used the last two years to wisely lay the deep and wide foundation for a new building called a better Nigeria. “Today, as I stand before you all, I implore him and his government. The good you have started ….do it the more. The good that you have yet to achieve ….get to it with a laser- like focus. “If we do as we must, we can well together construct this new building so that it will have place and habitation for those who have lived outside and on the margins to come in and finally partake of the bounty and good harvest a proud and true nation has to offer its people,” he said.